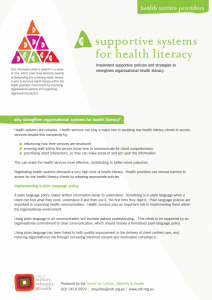 Why strengthen organisational systems for health literacy? prioritising client interactions, so they can make sense of and act upon the information. This can make the health services more effective, contributing to better client outcomes. Negotiating health systems demands a very high level of health literacy. Health providers can remove barriers to access for low health literacy clients by adopting appropriate policies. A plain language policy makes written information easier to understand. Something is in plain language when a client can find what they need, understand it and then use it, the first time they read it. Plain language policies are important in improving health communication. Health services play an important role in implementing them within the organisational environment. Using plain language in all communication will increase patient understanding. This needs to be supported by an organisational commitment to clear communication, which should include a formalised plain language policy. Using plain language has been linked to both quality improvement in the delivery of client centred care, and reducing organisational risk through increasing informed consent and medication compliance(1). A writing guide or an organisational style guide is an easy and straightforward way to foster a health literate environment. An official style guide ensures that all communication has embedded health literacy principles, enabling clients with low health literacy to understand all health information developed by the organistion. A nurse receives training in the teach-back technique at a cross-cultural communications workshop. She decides to implement a strategy with her clients when she gets back to her community health service. Using teach-back takes a bit longer, but she finds that it helps with behaviour change in the long run. Her colleagues also notice that she takes longer with her clients, but has better rapport and compliance. At their request, she teaches her colleagues how to use teach-back, and they recommend that it should be adopted across the health service. The health service includes used the teach-back technique on their client checklist to encourage staff to adopt this approach. References: 1. Australian Commission on Safety and Quality in Health Care, ‘Consumers, the health system and health literacy: Taking action to improve safety and quality’, Consultation Paper, 2013. 2. Fench, M and Hernandez, M., ‘Organizational Change to improve Health Literacy.’ National Academy of Sciences, 2013.